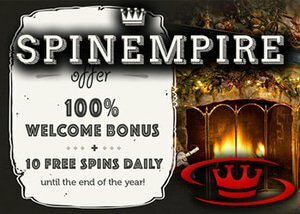 Spin Empire is really getting into the festive cheer with their special 24 Days of Christmas Promotion and giving away up to 240 free spins no deposit bonuses till the end of the year. To take advantage of the excellent Christmas casino promotion running at Spin Empire all you have to do is make your first deposit starting from just $30 and you will receive free spins every day until the end of the year. This promotion is geared towards new players at this online casino who want to enjoy some amazing NetEnt casino games. The 24 Days of Christmas promo includes a welcome bonus which is 100% + 10 free spins every day until the 24th of December 2015. The minimum deposit amount is $30 and the wagering requirements are 35x. You receive your free spins for 24 days after you have made your first deposit and the total amount of free spins that you receive during this promotional period is 240. This special festive deal is valid from the 1st of December 2015 up to the 24th of December 2015 so be sure to take advantage of it now. Once you make your first deposit at SpinEmpire you get to claim your daily bonus via the Live Chat section. Free spins can be used on some of the most popular NetEnt slots games including Starburst, Jack Hammer 2, Dead or Alive, Gonzo's Quest, Dracula, Bloodsuckers, Hook's Heroes, Invisible Man, Piggy Riches, Spinata Grande, and more. You can use your free spins to enjoy risk free gaming with the chance to win massive jackpot prizes. There are plenty of progressive jackpots just waiting to be won too, so if you don't have a real player account with this online casino, make sure you sign up for one today. All the games can be enjoyed on all devices including PC, iPhone, iPad and more. If you already have an account at SpinEmpire casino, there is an exclusive lucrative Christmas offer for all existing players so be sure to check out the promotions page for more information.